How do I control absenteeism in my contact center? It seems that nearly every contact center struggles to control absenteeism. No matter how accurate the planning is, when more people are missing than expected, the service suffers. Addressing this problem takes many forms and some solutions will work better in individual centers than others. A good place to start is analyzing the nature of the absenteeism. For the purposes of this article, absenteeism is defined as loss of staff who were scheduled to be available for incoming contacts. For example, when a shift bid is prepared for the upcoming quarter or longer, the schedules are defined on a generic basis without knowledge of who will want vacation during that period, which agents will be ill, training class schedules, etc. To account for these anticipated losses before the specific details are known, the planning process uses a placeholder for them called “shrinkage”. This is generally a percentage of paid time that people will not be available to handle incoming calls and it is spread across the time periods in a pattern that reflects historical losses. That percentage ranges widely from as little as 20% to more than 60% depending on the type of work done in that center, the benefits package, the day of week, time of day, and other factors. Once the schedules are assigned to individual agents, the details can begin to be inserted into these schedules to replace some of the shrinkage assumptions. A lot of vacations are determined well ahead of time and major training functions may be scheduled in advance. Established plans for team meetings and coaching sessions can be preplanned as well, once the agents and supervisors are matched up through the schedule assignment process. All of these are normal and expected losses. However, there are many last minute losses that are not built into the schedules before the workweek begins. These include such things as sick time, tardy, short-term medical or family leave (FMLA in the US), unplanned off-phone time, and general lack of adherence to the details of the schedule. Even the case of “no call no show” falls in this category. These types of absences cause the team to scramble to cover the loss by reshuffling available personnel, asking for overtime, and routing calls differently (to another center in the network, or an outsourcer, for example). But there is only so much that can be done within the day, so often these absences cause higher occupancy for the remaining staff on the floor and longer waits for customers. The next step to controlling absenteeism is to analyze the details. First, look at the “when” of absences by analyzing the distribution pattern of when the absences occur. Do they seem to cluster on certain days of the week, on the weekends, the overnight shifts, with specific call types, shifts starting at certain times of day, agents on certain supervisor teams, etc.? Each of these can be analyzed using a simple scatter diagram with the number absent on one axis and the cause you are considering on the other axis. One analysis that tends to show a correlation is looking at the impact of occupancy percentage on absenteeism (and ultimately on turnover). There seems to be “sweet spot” in occupancy. If there is not enough work to do, agents get bored, but if there is too much work and call after call, they feel overwhelmed. Both of these can cause higher absence rates. The other analysis is the “why” or the reason for the absences. Look at sick time, disability, tardy, unplanned off-phone time, lack of adherence, and other causes such as jury duty or family problems. Perhaps a Pareto chart of these various causes can reveal some that seem to be bigger problems than others and worthy of more attention. In one center I worked with, there was a spike of absences about every 3 weeks and most of it on Monday, this center’s busiest day of the week. Analysis revealed that the employees accrued paid time off at a rate that gave them a day about every 3-4 weeks depending on their tenure. 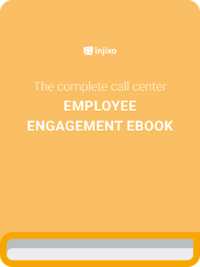 There was a significant percentage of the call center agents who felt compelled to take their accrued day as soon as it was available and there was not a lot the call center could do to change that behavior. However, it was also the general practice of the Human Resources department to make the accrual available on Saturday of the week it was earned. That drove a lot of the Monday absences. By working with the HR team, the call center staff accruals were changed to Tuesday so that employees who wanted to take the day immediately were less likely to take in on the following Monday. The impact was the same rate of loss overall, but less of a spike on the busiest day of the week. In another center, there were several agents who could not seem to return from their lunch break on time. These employees had been put on disciplinary action and some were even terminated for this reason. Further discussion with these agents revealed that they wanted to do other things at lunch outside of the center and the current lunch period schedule did not accommodate that. At the same time, the center was finding that it needed more people early and late and fewer in the mid-day period. This center defined some split shift options with a 2-hour break in the middle of the shift and the employees who wanted this shift were happy to take it. It solved the problem of tardiness for these individuals and helped smooth out the staffing plan for the center at the same time. In a large multisite center, daily absenteeism was very high and a high percentage of it was unpaid time. The agents simply were willing to forgo some income to get more time off and there was no penalty for doing so. Rather than put a punitive process in place to address the problem, this center chose to implement a performance-based shift bid ranking. A major element of the performance criteria was based on attendance so that those who showed up more often got a higher rank and a better chance of getting their desired schedules. In just a couple of months, the absentee rate dropped. It seems that choice of schedule is a powerful motivator to encourage the desired behaviors. The point is that there is no one answer to high levels of absenteeism. There are many causes and some are not obvious without analysis of the historical patterns. However, this will require that the center gathers the information on the absences in more detail than may have been used in the past. Every type of cause reported needs to be tracked separately. With good detail in the data, the analyses can help to reveal the patterns and causes so that meaningful action can be taken to address the situation. If your current data does not provide the detail you need, develop a plan to ensure it is available in the future. Look for the “when” to identify potential patterns and complete the suggested scatter diagrams to identify the cause and effect relationships. Armed with this level of detail, you can perform some “what if” analysis and cost/benefit scenarios to show to management and support any suggestions for improvements. Management is much more likely to be convinced of the scope of the problem and the value of the suggested changes when there are solid facts and data to back it up. This makes WFM a true partner in solving problems.